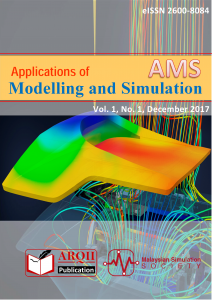 APPLICATIONS OF MODELLING AND SIMULATION (AMS) is an open access peer-reviewed journal intends to report latest work on methodology and applications of Modelling and Simulation in many areas. The areas include Engineering, Technology, Sciences, Computer Science and Education. In addition, in the emerging of Artificial Intelligence (AI), papers related AI are also welcomed. AMS is published three times a year in April, August and December. Papers submitted to AMS can be in the form of survey/tutorial, regular papers, brief papers and case studies. It is aimed that this journal will provide an international platform for publications of latest work describing theoretical and practical aspects of Modelling and Simulation. There will be NO processing charge for publication in AMS. Upon submission, the editorial decision together with peer-review comments will normally be sent to author(s) within three weeks. AMS is published in Association with the Malaysian Simulation Society (MSS). MSS is a learned society and affiliated in the Federation of Asian Simulation (ASIASIM) together with several simulation societies in Asian (Japan, China, South Korea, Singapore and Malaysia). 81310 Johor Bahru, Johor, Malaysia.